Cute Puppy Guards Its Little Sleeping Master. The Adorable Video Has Collected 62 Million Views! The friendship of young children with animals is a never-failing source of joy and fun. It is interesting to observe how they interact with each other in play, on vacation, or while eating. It helps children to learn to love animals and care for them from a tender age, and reminds us all to have some compassion for defenseless creatures. Sometimes people claim that it is a risk to have animals around babies and young children. However, there is a huge amount of compelling evidence that they get along perfectly. Here is a brilliant example of it – an adorable video of a dutiful puppy guarding its little sleeping master. The internet community immediately fell in love with this duo, with the video collecting 62 million views so far! At first, the determined pup sat in front of the sleeping baby desperately trying not to fall asleep too. Every time the guardian was drowsing off, it remembered about its important mission and sat up straight. Finally, it walked around and found a way to ensure the little one’s safety in a more comfortable position. 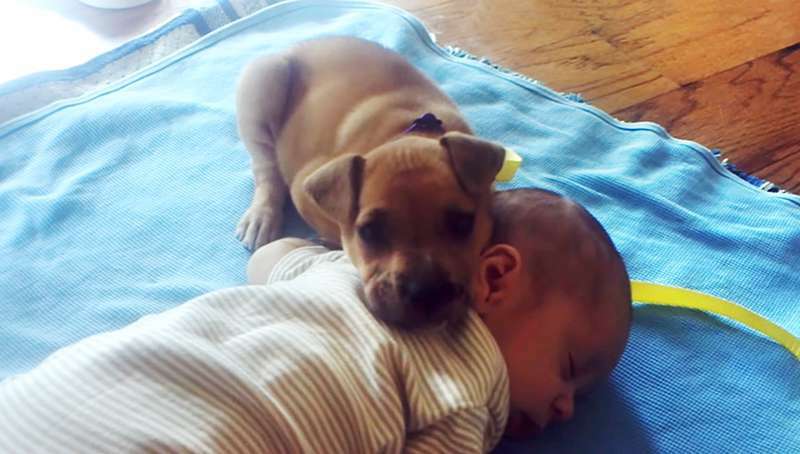 The puppy gently lay down on the sleeping child's back and melted our hearts! 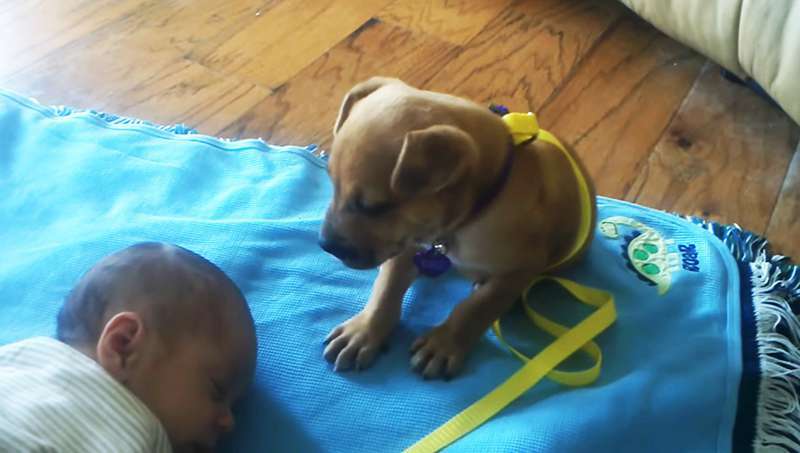 To cheer you up, we put a similar video of a sleeping baby and its tiny four-legged friend below. Do you have such videos in your family archive? Can you show us?